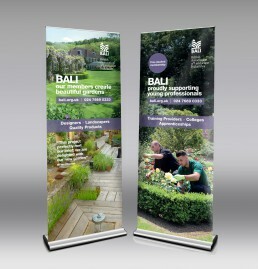 The British Association of Landscape Industries, is the trade association of choice for the UK’s top landscaping professionals, and encourages them to be leaders of an environmentally and ethically sustainable landscape industry. 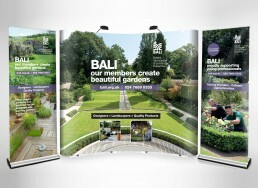 The Blueprint Design Company has worked with BALI for several years now, and they recently asked us to deliver a set of exhibition graphics for use at various industry events. 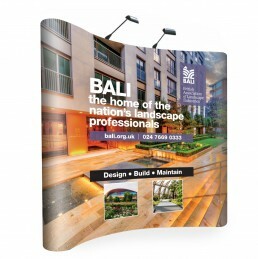 With a strategy to create distinct awareness channels for the general public, students/colleges, and established landscape professionals, we created pop-up stands and large format graphics for each target audience. With our expertise in creating exhibition friendly graphics, our designs place contact information and branding, at eye level or above. 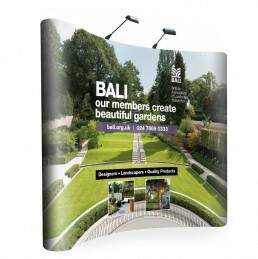 This makes them easy to spot across a busy exhibition hall, and allows for seating or a pop up reception desk to be placed in front.